Hot off the block, Julep is a vibrant new band coming at you from Massachusetts. Their synth pop tunes and ever so kaleidoscopic feels are keen to be heard and danced to. 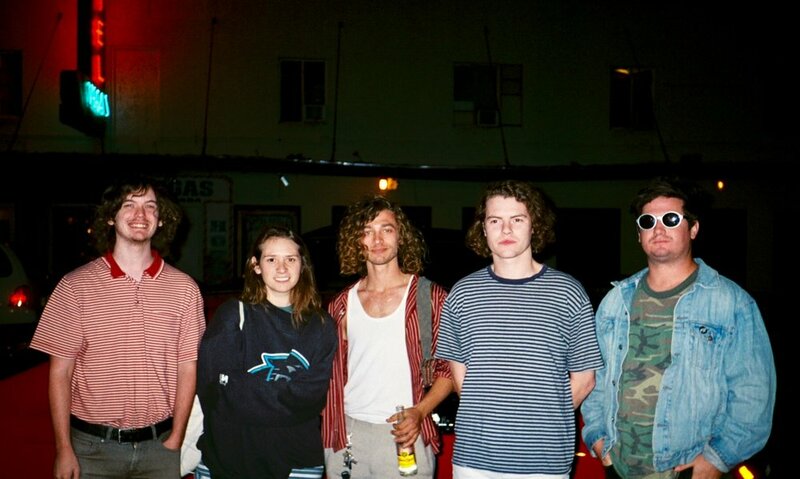 With their first album currently in the works, this party of 5 has been taking full advantage of house shows and venues to give out a sneak peak of what is to come. I caught up with TJ, Sarah, Nick, Andrew, and Ian before seeing them live in action to explore more about their upcoming album and what they see in their future, followed by a wicked performance at Hotel Vegas. TELL ME ABOUT WHERE YOU'RE FROM! IS EVERYONE FROM MASSACHUSETTS? S: TJ and I grew up outside the city in New York. TJ: I came to Boston for Art school. Now me, Nick, and Andrew all live there together. Sarah lives in Providence which is about 40 minutes from us. SO JULEP IS A FRESH, NEW BAND? S: Hot off the block! HOW DID YOU COME ABOUT STARTING THIS PROJECT IN ADDITION TO YOUR OTHER BANDS? TJ: I was doing a project for a long time, and it was just me doing everything all myself. We all started playing. Sarah joined the band, Nick came from Colorado to join. It was kind of just a long time coming. I had recorded an album when I was 18, and I waited a long time after going through about 15 members until we finally developed a good solid group together. We gelled really well together, and were writing together, so it was less emphasis on my whole thing and more on this group dynamic. WHAT'S THE MUSIC SCENE LIKE IN MASSACHUSETTS? TJ: Depends who you ask. It’s cool. It’s a college city, so every 4 years it kind of builds up and it’s awesome, then it just kind of resets when kids move. There’s new house shows, new bands, and it’s really exciting. It’s strange when you’re there and seeing it go up and down before your eyes. YOU TWO ARE SIBLINGS, SARAH AND TJ. DID YOU HAVE A BIG CREATIVE INFLUENCE ON EACH OTHER WHEN GROWING UP? S: Yeah, I taught him everything he needs to knows! TJ: I don’t really know, I tinkered around with a guitar for a while, but I didn’t really take it seriously until I got to college. I took a guitar with me to school. I found that art school can be intense and guitar is a good escape. S: You need another outlet. TJ: I ended up playing guitar like 8 hours a day during my first year. S: Then we just needed each other to play in each other’s bands. "STRANGE" AND "GOODBYE GARDEN" ARE TWO SONGS THAT WERE RELEASED ON YOUR BANDCAMP IN SEPTEMBER. CAN WE EXPECT MORE TO BE ADDED SOON? TJ: Soon. We have a whole album, and we’re beginning to write more for the next album but we’re kind of sitting on it for right now. Nick: We’re still looking for a little push to finish out the album. So it will still be a little bit. TJ: We posted these songs to go on tour. I get really intense with the production side since I have a recording background. It takes a lot for me to release something since I get really hung up in the little details. So we just decided to put it out for right now, and we’re really proud of those two songs! ARE YOUR NEW SONGS GOING TO BE SIMILAR TO THE SHOEGAZE PSYCH ROCK FEEL YOU HAVE GOING ON NOW? TJ: Yes. I think the reason we put those two out there first is because they kind of encompass the two directions the album goes. YOU STARTED THIS TOUR ON OCT. 4TH AND GOING UNTIL NOV. 1ST. WHAT'S IT BEEN LIKE SO FAR? S: It’s been a mixture of house shows and venues. It’s a nice time to tour because you’re getting the best weather of all the states...until you go home and the weather is miserable! It’s like extending the weather and I hate wearing long pants so that’s really sick. I SEE YOU GUYS LIKE ROAD SIDE ATTRACTIONS! HAVE YOU SEEN ANY IN AUSTIN YET? S: Yes! We’ve been seeing a lot of roadside attractions. There’s this one in Texas that looks like peanuts sitting down on a couch. We always pass by but I haven’t gotten to see them yet. TJ: Finish up the album, for sure! We’re hoping to have some tapes and vinyl soon.